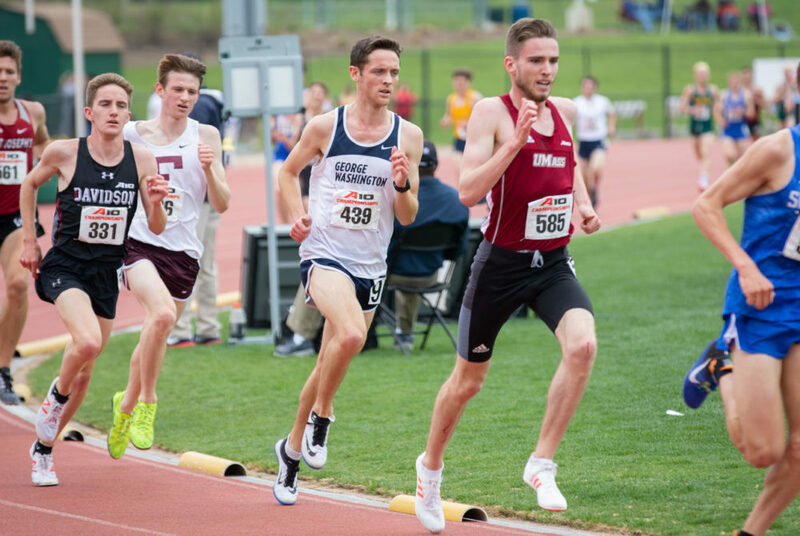 Senior Carter Day ran the 5,000-meter race at the Atlantic 10 Outdoor Track and Field Championship earlier this month, where he qualified for the NCAA East Preliminary Competition. Two steeplechase racers have become the first in outdoor track and field’s four-year history to qualify for an NCAA competition. But neither of the runners ever competed in the event before this year. Senior Carter Day and graduate student Matthew Lange will both compete at the NCAA East Preliminary Competition in Tampa, Fla. later this month as the first in program history to score a spot. Day and Lange will represent GW as the only Atlantic 10 school with two runners qualified for distance events on the men’s side. Day started running in the 3,000-meter steeplechase race this season because he wanted to try something new in his final year as a Colonial. But what started as an “impulse decision” by Day became his ticket to the national preliminary competition, after capturing gold at the A-10 Track and Field Championship with a 8:58.40 split earlier this month. He enters the competition in 32nd place. For coach and runner alike, Day’s success at the steeplechase has been an unexpected surprise. Day, who is a member of the program’s first recruiting class, said his trip to the national competition in his final program year is the product of both his training and continued patience with himself throughout his career. In addition to holding the program record for the 3,000-meter steeplechase, Day currently holds the program record in the 5,000-meter race. His gold in the 3,000-meter steeplechase at the A-10 Championship inked his name in the record books as the first runner in program history to win an event at the outdoor track and field championships. Day also captured gold in the 5,000-meter race at the meet. Despite coming to GW with hurdling experience, Day had a tough start at the event. At the Colonial Relays in April, Day did not finish his first-ever steeplechase race after tweaking his foot clearing one of the barriers. But one week later, Day set a then-program record in the event, besting Lange’s previous record and finishing second in the field. Lange secured his spot for the NCAA preliminary race in the 11th hour, running a 9:00.11 at the IC4A Championships Saturday, good for fourth place at the meet and a personal record by seven seconds. The last day to qualify for the preliminary race was Sunday, and entering the national meet, Lange sits in 38th place in the field of 48. Weir said he was looking for the graduate student to also qualify for the NCAA meet at the A-10 Championship, but an off race for Lange meant he had just one more chance to qualify during his race at the IC4A Championships. As a Colonial, Lange is part of the program record-setting 4×1600 meter relay team and tops the all-time performance list for the 10K race in cross country with a time of 31:13.4. For Lange, steeplechasing had always been around him. At Furman as an undergradute, his coach Robert Gary was a two-time Olympian in the steeplechase, and his roommate was a two-time All-American runner in the event, he said. The top 12 of the 48 competitors in each event will qualify for the NCAA Track and Field Championships in Eugene, Ore. in June. Weir said he wants his runners to enjoy the race but to fight and take a swipe at one of the top-12 spots. “This is the best in the country they’re going to race with, and I’m looking forward to them to go mix it up with the best and see what they can do,” Weir said.